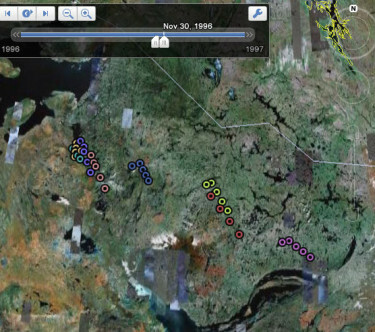 For 25 years, the Bathurst Caribou Herd has been monitored using satellite telemetry, creating an important and very cool record of their movements across the tundra, and how that movement has changed. I took that temporally and spatially enormous data-set, time-linked it and processed it to look fluid as an animation in Google Earth. The project product had be portable to remote classrooms where there was limited or no network availability. Consequently the data is stored entirely in stand-alone files, rather than streamed over a network link. Those files are available above but may take a moment to download and open. 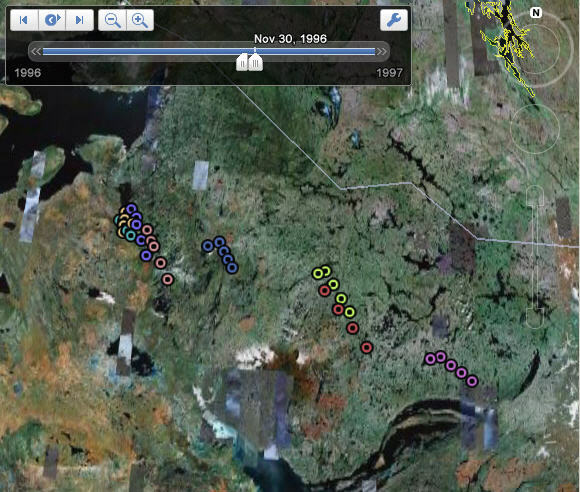 Google Earth allows for the time-linking of data. By scrubbing a time-control slider back and forth, a user can see how data changes over time. This is a significant improvement, allowing us to go beyond “where” and “how much” and to begin to tell three dimensional stories about flow and dynamics, which gets us closer to “why” and “what will happen”. Damian Panayi of Golder & Associates saw the potential of telling the story of the migration of the Bathurst Caribou Herd, using data painstakingly collected over many years by satellite-linked GPS collars. It’s a huge and very cool dataset. I brought the data into Google Earth, and established the time linkages, but it was jerky and hard to follow due to inconsistencies in the timing of locations. So I developed a method to create interpolated “ghost” locations in between the real ones, smoothing out the flow. I also made a second version of the data, collapsing many years of migrations into a single virtual year, making clear the changes in migration patterns over the years. In the end it was a huge dataset — hundreds of thousands of lines of KML code! But the results are compelling, and are now in use in the curriculum of the Northwest Territories Ministry of Education, Tourism and Culture.